Air Conditioning - The professionals at Good News Auto Repair are experts in trouble shooting and repairing your vehicle’s air conditioning system. Get ready for summer (it’s usually warm all year round here in sunny Edmonton) and bring your vehicle to us for a A/C system check up. If your A/C isn’t as cold as it used to be or perhaps isn’t working at all… call or stop by today for an appointment. There are many mechanical, electrical and chemical components that make ice cold air conditioning possible. Here is a basic explanation of the air conditioning process: The A/C compressor is the “heart” of your vehicle’s air conditioning system. It is mounted on the engine and is turned by the engine’s belt. As the belt turns the compressor’s pulley it pressurizes the air conditioning system refrigerant and pumps it to the condensing coils. On your vehicle, these condensing coils (referred to as the condenser) are located in front of the radiator. The condenser is the A/C system’s “radiator” which is a completely separate unit from the engine radiator. As the compressor compresses the refrigerant gas, the gas gets very hot. As the hot refrigerant gas passes through the condenser, the heat from refrigerant gas is expelled to the air flowing across it from the front of the vehicle. While you drive, the engine’s fan and the air rushing into the front of your vehicle removes the heat from the hot compressed refrigerant gas inside of the condenser. When the refrigerant leaves the condenser, it is cooled to its saturation temperature. When the saturation temperature is reached, it will change phase from a gas into a liquid (this gives off a bundle of heat known as the “latent heat of vaporization”). The liquid then passes through the dryer and into the evaporator. The evaporator houses the coils inside (within the passenger compartment) of your vehicle. When the liquid refrigerant is inside of the evaporator it loses the pressure that was added to it in the compressor. This causes some of the refrigerant liquid to change to a low-pressure gas that cools any remaining refrigerant liquid. This two-phase mixture inside the evaporator absorbs the heat from the air across the evaporator’s coils. Within your vehicle’s dash is a blower fan that forces air across the now very cold evaporator coils. The cold air is then diverted through ducts that lead to the A/C vents. Ahhh… nice, cold A/C! 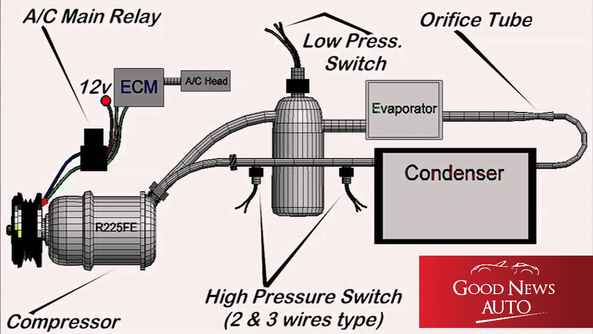 After leaving the evaporator, the refrigerant goes through an expansion valve and then back to the compressor. This cycle is repeated again and again. ﻿﻿Good News Auto﻿ - ﻿Best Auto Repair Shop Reviews﻿ - Expert Mechanics in Edmonton offering the Best Auto Repair Services.